Air Drain Blaster resolve all kinds of the problem of pipe blockage. The drain blaster can effectively remove hair, cloth, tea, vegetable, grease, accessory and rubbish from pipeline. 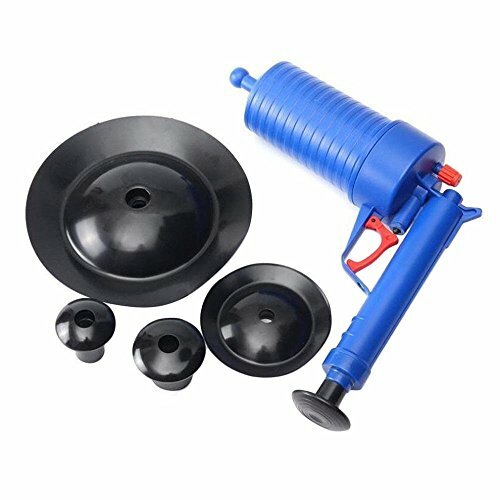 The drain blaster uses the power of high-pressure compressed air to blast away the toughest clogs in your drains in just seconds.Just pump the drain blaster and squeeze the trigger, the clog is cleared instantly. Much faster than traditional plungers and snake and No more wasting time on drain openers. High pressure air power, Unlogs Toilet Plunger Set can deal with various blockages caused by all sorts of rubbish such as hair, cloth, tea, leaves, grease,oil dirties and so on. ABS gun body, natural rubber blocked head. A natural rubber that is tough and durable for our drain blaster. 2 Years Warrany and Free exchange. If you have any questions about this product by Fun-Ker, contact us by completing and submitting the form below. If you are looking for a specif part number, please include it with your message.